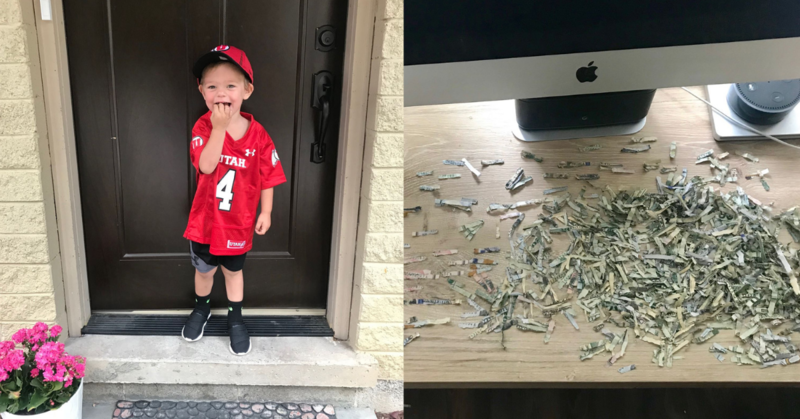 When a Salt Lake City couple left an envelope out with $1,060 inside, they didn't think their 2-year-old son would do anything with it. Well, they thought wrong. Ben and Jackee Belnap were saving the money to reimburse Ben's parents for University of Utah season football tickets. They left the cash-filled envelope on the counter, so they wouldn't forget to take it to them this weekend, Jackee told CBS News. "We realized it was gone the next day and started to search. We searched everywhere in our house and could not find it," Jackee said, "I have a bin where I put junk mail and any files I want shredded and my son and I shred it when it gets full. I looked through that and then it made me think to look in the shredder." She found the money, but not exactly in its proper form. The cash was cut up into tiny pieces. "We were silent for about five minutes and just sorted money out and then I broke the silence and said, 'this will make a great wedding story someday,'" said Jackee. The couple knew their son Leo was the culprit, because he regularly helps them shred junk mail. "Leo had no idea he did anything wrong," said Jackee, "It felt unfair to get mad and he probably doesn't even know what cash is as we use our credit card for almost everything." Jackee says the couple learned their lesson and won't be leaving valuable envelopes, or anything that could inadvertently end up in the shredder, out again. While the money isn't exactly usable at the moment, there may be hope for the cut-up cash after all. Jackee says her husband called the government department that deals with mutilated currency, and was told he could send the shredded money to them and the couple would get their money back. But, they may have to wait a while. "They said it takes 6 months to 3 years. So we will see?" said Jackee. Thankfully, Ben's parents were understanding about the situation. "They said they can be patient to get paid back when the treasury can sort through it," Jackee said.